Jonathan Rose Companies stands as one of the country’s most innovative developers and their latest building, the Caesura, is a testament to that fact. 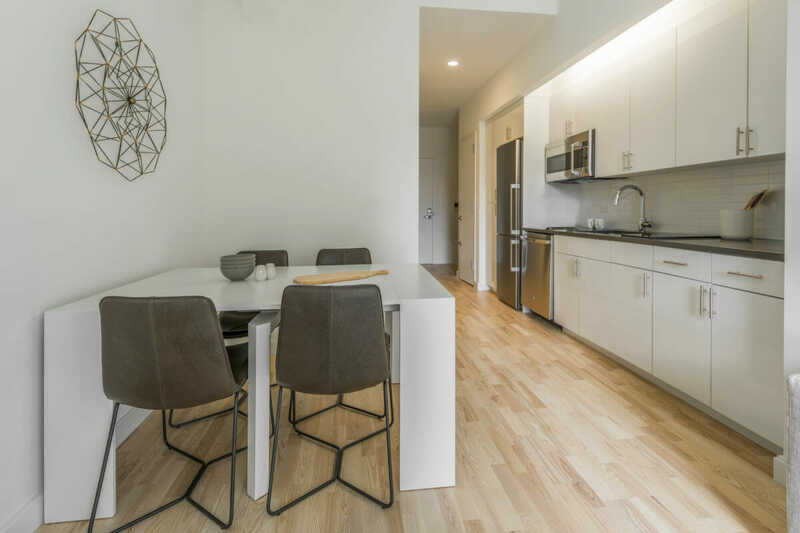 Located in Brooklyn, NY, every aspect of the building—from its unit design, location, and unique building amenities like a lending library—was designed to meet the needs of the modern urban renter, and Resource Furniture is proud to be part of the equation. Fundamental to the Caesura’s design is convenience, and this is one reason Resource Furniture was brought onto the project. Thirty-four of the building’s 123 units are furnished micro-studios. They include several of our pieces including the Swing sectional sofa wall bed and Penelope sofa wall bed, media cabinets with 49” smart TVs, additional cabinetry, and two types of transforming tables (the Mini Table and the Goliath). Resource Furniture worked with JRC in the space planning for the furniture as well as logistics, installation, and ongoing service. The furniture gives the units an elegant, spacious look, but also gives them functionality that exceeds the unit’s compact dimensions (314-384 square feet). For example, our Mini Table acts as a coffee table during the day and an eight-person dining table at night. This space efficiency is critical in a part of Brooklyn where rents rival those of prime Manhattan locations. By using our furniture, JRC was able to extract as much value out of the spaces while maintaining a price point in line with market comps. 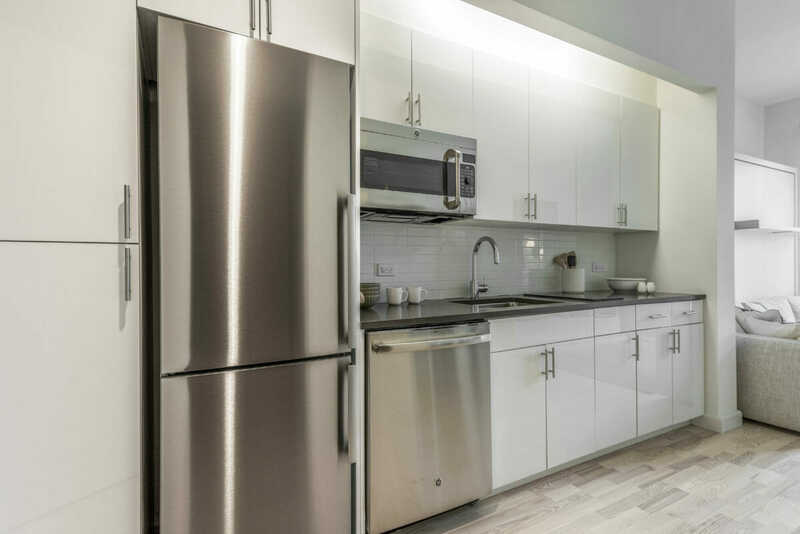 The move-in readiness gives the units product differentiation, important in the highly-competitive downtown Brooklyn rental market. The furnished units are also fetching a 25-40% premium on a square foot basis over the building’s unfurnished studios. The move-in-readiness of the micro-apartments is one part of the Caesura’s convenience quotient, but the other is its location. Steps from the Atlantic Avenue subway station, as well as the Brooklyn terminal for the Long Island Railroad, it is one of the most accessible locations in New York City. Though we don’t have data to support this, we would bet the proximity to the LIRR station makes the micro-studios a perfect pied-à-terre for commuters. But the location also has a buffet of amenities including Whole Foods, an Apple Store, Target, Trader Joe’s, Barclays Center, Brooklyn Academy of Music (BAM), and hundreds of restaurants. The building has its own amenities as well, including a fitness center, game room, bike parking, and rooftop garden lounge designed by SCAPE. But by far the most unique amenity — one the NY Times picked up on—is the building’s “Common Goods” lending library. The library contains nice-to-have, but not-essential items such as porcelain dinner service for 12, a ladder, a sewing machine, a guitar with amp and an ice-cream maker, all of which can be checked out by the building tenants. Back in 2011, Resource Furniture got involved with Citizens Housing and Planning Council’s (CHPC) “Making Room” Initiative, which sought to better align New York’s housing stock with the way New Yorkers actually live. It especially underscored the need for more housing for singles, as well as the role good design plays in making the most of the city’s limited real estate. That initiative lead to Carmel Place — the city’s first purpose built micro-apartment building— which also incorporated our furniture in many of its compact units. 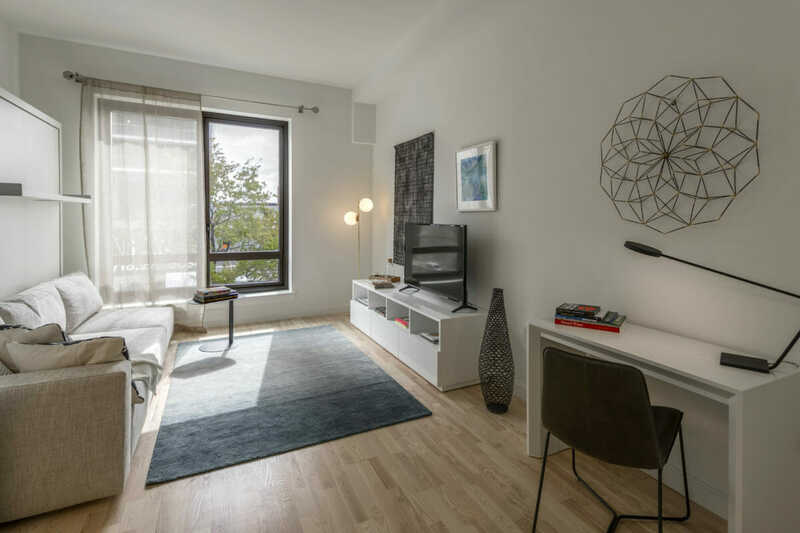 Now the Caesura is picking up the micro-mantle, evolving the concept on a building-wide scale, and providing further validation that the market wants move-in ready, space-efficient rentals for singles. 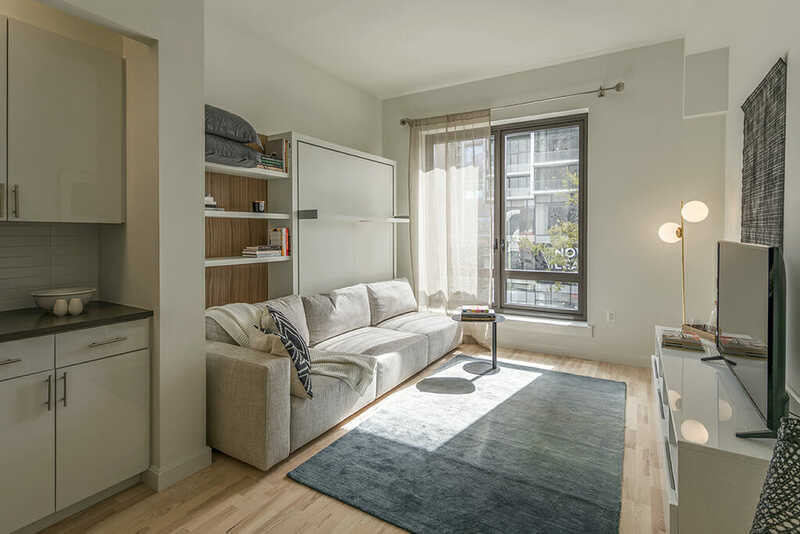 Micro-units at Caesura, a new mixed-use building in the Brooklyn Cultural District, come with space-saving furnishings, like this bed that folds up to become a sofa. With a nod to the millions of New Yorkers who live alone, studio apartments of less than 400 feet are setting new standards for efficiency. Now tiny living has arrived at the Brooklyn Cultural District with Caesura, a mixed-used building developed by Jonathan Rose Companies. It is a project of New York’s Department of Housing Preservation and Development, with 40 percent below-market-rate apartments. This newly constructed building at 280 Ashland Place, on a former parking lot diagonally across from the Brooklyn Academy of Music, is 12 stories and has 123 units, including some of the smallest legal rentals in the five boroughs. 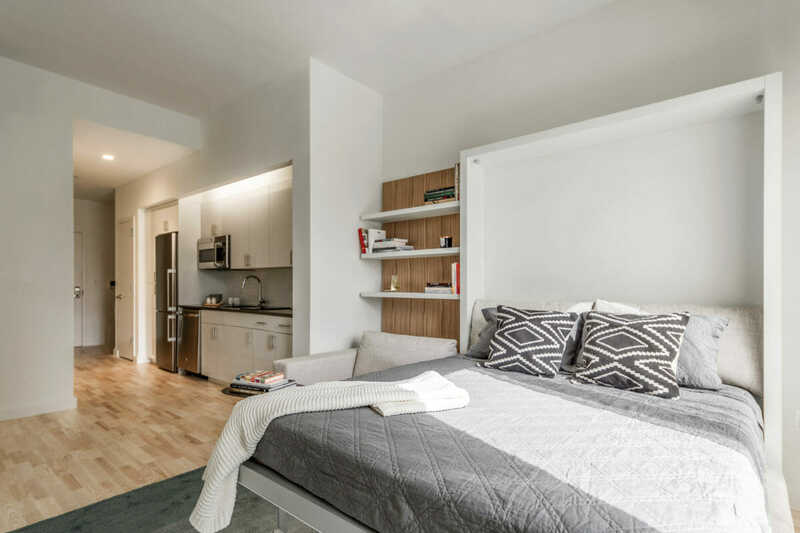 Its 34 market-rate micro apartments are no more than 384 square feet and come with space-saving furnishings by Resource Furniture that allow tenants to leave their futons behind. A shelf that protrudes from the upright bed in this micro unit remains impressively horizontal even when the bed is lowered from the wall. Caesura’s most unusual feature, though, is a lending library, open to all tenants, with three dozen items including a porcelain dinner service for 12, a ladder, a sewing machine, a guitar with amp and an ice-cream maker. Jonathan Rose, the developer, described the collection as “common goods,” a means of reducing consumption and clutter while having access to products one might otherwise splurge on. If that sounds like “the common good,” the echo is intentional, he said. Caesura bets that tenants will pay more for small private quarters in exchange for a raft of attractive communal spaces and amenities just beyond their door. 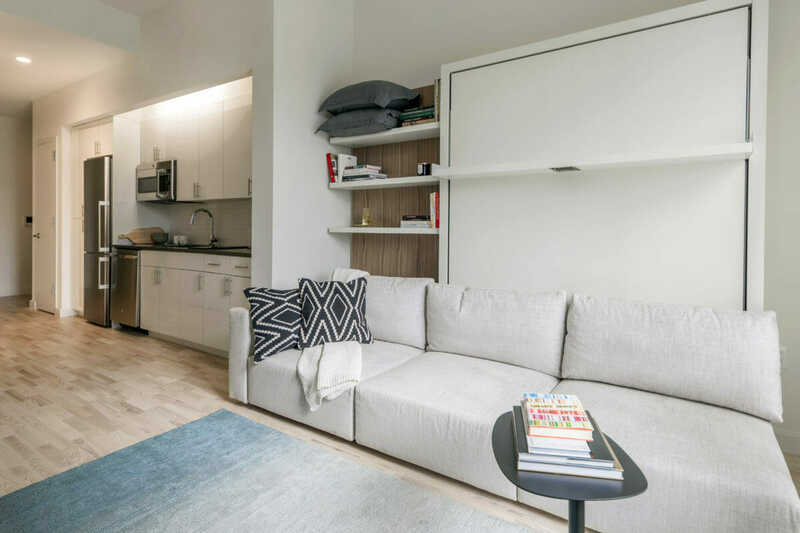 The market-rate micro units — described by the developer as furnished studios — start at $2,588 per month for 314 square feet, while unfurnished studios are bigger, but cost less, from $2,360 per month for 414 square feet. Each micro unit comes with a two-burner induction cooktop, a combination microwave and convection oven, and a dishwasher. Each market-rate micro unit has a queen-size Murphy bed, and many have a slim desk or coffee table that expands into a dining table. Each comes with a two-burner induction cooktop, a combination microwave and convection oven, a dishwasher, a desk lamp, a walk-in closet and even, in about half the units, a shelf that protrudes from the upright bed and remains impressively horizontal when the bed is lowered from the wall. A long sideboard is included, as are the LG 49-inch LED smart television that sits on it and monthly cable and Wi-Fi service. Caesura has larger units as well. Market-rate one-bedrooms begin at $2,739 per month for 652 square feet, and two-bedrooms at $3,869 per month for 814 square feet. The building, with interiors designed by Dattner Architects, will have a fitness center, a yoga and meditation studio, a game room with a wet bar, a basement bicycle room with a tool station and a rooftop garden lounge with plantings by the landscape design studio SCAPE. Micro-units start at $2,588 per month for 314 square feet and include furnishings like a slim desk that expands into a dining table. Similar amenities are found in the big, sleek towers filling Downtown Brooklyn, Mr. Rose said, but he expected Caesura’s compact size to foster a collective spirit. “The underlying concept is how to make a more intimate, sharing and community-focused building,” he said. A ground-floor space of about 20,000 square feet will be the new headquarters of the nearly 200-year-old Center for Fiction, which is moving from East 47th Street in Manhattan. About 3,700 square feet of commercial space will be taken over by the Mark Morris Dance Center, which is next door, to be used for rehearsal studios. A yet-to-be-named retail establishment is also planned. The anticipated move-in date for residents is Feb. 1. A version of this article appears in print on December 10, 2017, on Page RE6 of the New York edition with the headline: Tiny Living, With a Raft of Amenities, Comes to Brooklyn.